This entry was posted on 12121212, in Liberation Stories. “One of the stories I like to tell in this regard is a tale of Venerable Master Hsüan Hua’s teacher. Master Hua was the abbot of the City of Ten Thousand Buddhas. He was the person who gave us the land where our monastery is situated, and he and Ajahn Sumedho were very good friends. Master Hua’s teacher, Venerable Master Hsü Yün, was the patriarch of all five lineages of Buddhism in China and was very highly respected. He was the head of the Ch’an lineage, the sutra lineage, the mantra lineage, the Vinaya lineage, and the esoteric lineage. It’s no secret that different sects tend to argue with each other. Yet he was so indisputably pure and skilled that everyone wanted him to be the head. When the Red Chinese took over, they were trying to wipe out religion altogether and so he became a very obvious target. 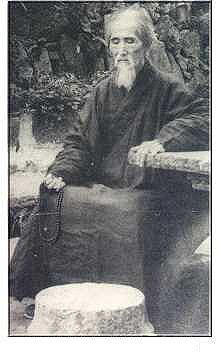 The Chinese army attacked his monastery when he was about 110 years old. They beat him with wooden clubs until he was a bloody heap on the ground and left him for dead. Even though he had broken bones and damaged organs, he recovered. The news of his survival spread around the area. 2. Do it for a specified number of repetition. The number should be abit challenging for you, but should not be too challenging that you feel extremely stressed to do it. You should set yourself a time frame to finish it. 3. At the conclusion of each session, dedicate it for Universal Liberation of all Beings, Global Peace, No disasters, Well-being of global economy, etc. as you can think of. 4. This practice should be on top of (or additional to ) what you practice daily already. This is to put a level of sincerity and exertion in it. 5. 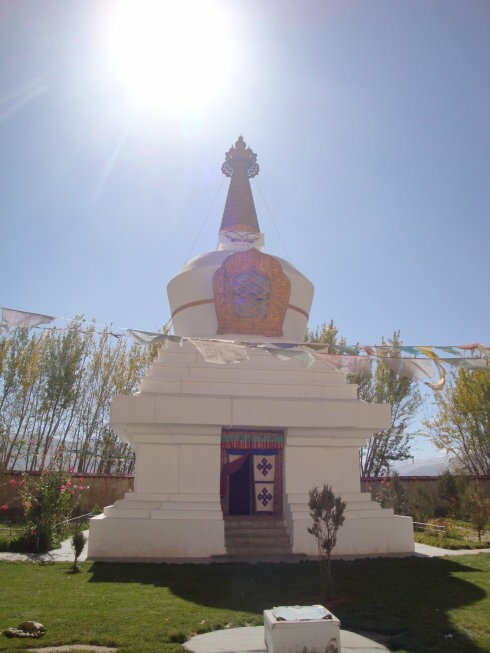 You simply join your palms at your heart and face this image shown below of a holy Vajrasattva Stupa (near Lhasa), adjust your motivation to Bodhichitta, and, from your heart, make your commitment specifically and then it’s done! There is no need to report your commitment to me. Buddhas and Bodhisattvas know your commitment automatically, just do it from your heart and we are on our way. May the positive group momentum from this mini-monlam, the power of the prayers, the strength of all the good-will and dedications, and the blessings of the Buddhas and Bodhisattvas we invoke be completely dedicated to the ultimate liberation of all beings from all forms of sufferings and delusions. This entry was posted on 12121212, in monlam. Meet Ani Ngawang Pema, who has retreated for 45 years reciting the mani mantra. Very inspiring. This morning, His Holiness gave a teaching on the working of Mara and how we should be counteracting the challenges posed by the Mara and his manifestations. Mara does not like virtuous activities, therefore he manifests as laziness, body pains, anger and all sorts of emotions to discourage us when we perform virtuous activities. We have to be strong enough to fight with him and move ahead like a bulldozer. These challenges are good if we know how to use them as support. As they will be able to accelerate our progress on the spiritual path. We should not be weakened by Mara and his manifestations, instead we should be working on them as a practice. When we succeed, when we win over them, we will have positive results in our practice. His Holiness continued saying: I have a lot of obstacles whenever I do a pilgrimage like this. During the bicycle pilgrimage, my robe was caught in a wheel and I hurt myself, but I didn’t tell anyone; I just continued. Half way through, a jeep knocked me so badly that I was thrown in the air, I fell down and broke my nose. I wasn’t worried about my nose, I was just worried about my bicycle and my injured knee. If I couldn’t continue, the pilgrimage had to stop. So I pushed myself to continue, peddling only with one leg. During Sikkim Pad Yatra, I slipped on a very small stone and injured my ankle, on my way to one of the holiest sites of Guru Rinpoche. I could have told the group to continue and allowed myself to discontinue the Pad Yatra and check into a hotel. I pushed myself to continue even though my entire leg was swollen due to the injured ankle. This time at the beginning of the Pad Yatra, so many blisters appeared after just a few hours of easy walk and my backpack became heavier by the day without me adding any additional things. In fact, I removed my tent and some belongings, yet it still got heavier by the day, even my strong monks couldn’t believe how heavy my backpack has become. And of course, I caught a flu two days back and lost my voice, because of this, I couldn’t teach until this morning. All these I know are manifestations of Mara, to stop me from accomplishing great merit and great purification, and they know that if they stop me, the entire Pad Yatra has to end prematurely. You can check my backpack, how heavy it is, it is like having invisible rocks in it. I am not telling you this to scare you or boost my ego, Mara and his manifestations are with us all the time. Whenever we are off guard, they will win the battle. Persevere in spiritual practice fearlessly with joyful effort! This entry was posted on 12121212, in Teachings, Uncategorized. Because this story is part of traditional Zen lore, students of later generations, including people all over the world today, have taken it as a handle on Zen study. Some people say it represents the so-called three barriers of Zen. Others say that it is necessary to reach the point at which you see that mountains are not mountains and rivers are not rivers, and then turn around again to arrive at seeing mountains as mountains and rivers as rivers again; this they identify as the realm of great penetration and great enlightenment. In reality, these explanations are ultimately just impressionistic talk; these views may seem to be correct, but they are not. First, it is necessary to understand clearly that this talk by Zen Master Wei-cheng is about his own personal experience in practice. When it comes to the matter of whether Master Wei-cheng had actually attained great penetration and great enlightenment himself, you first of all cannot invent some fabrication and make up a subjective determination of the issue on his behalf. His first stage, where he says he saw mountains as mountains and rivers as rivers, of course, represents the state of anyone before studying the Zen Way. Everyone is like this, seeing mountains, rivers, and earth, the various humans and natural environments in the physical world clearly and distinctly; this does not require any special interpretation. For the second stage, where he said he saw mountains are not mountains and rivers are not rivers, it is one hundred percent certain that this is a state achieved through the actual application of meditative concentration work. If one has genuinely practiced meditative concentration work and the method and process of cultivation realization, and if one’s inner and outer physical and mental application and conduct have not gone astray in any way, then eventually this should cause the physical and mental temperament and constitution to undergo a great change. The eyes will be full of spiritual light, the spirit will solidify, the energy will mass, and the material world seen by the eyes, the mountains, rivers, land, and so on will naturally seem as though one is in a waking dream, like images of light reflected in water. One will feel that everything in this material world is all dreamlike, illusory existence, totally unreal; and one will also see people as like mechanical robots. Many people who reach this stage, whether they are studying Zen or practicing Taoism, thereupon assume it is the true Way, but really this sort of state has nothing to do with the Way. This happens because of long immersion of the body and mind in quiet concentration, resulting in diminution of psychological and biological instincts, and repletion with vital energy that causes the brain and nervous system to undergo a change resembling electrical charging, so one sees the phenomena before one as ephemeral and has no feeling of reality. This is similar to the scattering of vision experienced when the body is depleted and weakened after a serious illness, or when one is about to die. Of course, this phenomenon associated with sickness and dying does not itself represent the state of people practicing meditative concentration who see mountains and rivers as not being mountains and rivers: it is just a way of making a comparison. One is due to illness or dying; one arises from being filled with the living power of life; so they are not exactly the same. But you must not forget that this kind of phenomenon is just a different sensation of the biological organs; what enables you to produce such feelings and cognition is still the function of your consciousness and thought. If you assume that seeing mountains as not being mountains and seeing rivers as not being rivers is a good phenomenon reflecting practice of Zen or Tao, that is still mediocre; if so, then you might as well take a hallucinogenic pill or a moderate dose of tranquilizers, for would that not cause a similar marvel? Can you say this is the Way? So many people who study Zen and lecture on Zen today, both in China and the rest of the world, often bring up this issue. I cannot but add some explanation to the matter so that practitioners avoid making the mistake of entering into byways and ruining the useful physical body. Coming to Zen Master Wei-cheng’s third stage of seeing the mountains as mountains again and seeing the rivers as rivers again represents a Zen state where he had advanced a step farther, so he said of himself that he had attained peace. If you just go by these remarks and assume that this is great penetration and great enlightenment, then you might as well relax and go to sleep, waking up to see that mountains are still mountains and rivers are still rivers. Would this not be more direct and enjoyable? Therefore it is really not easy at all to read the classics and stories of Zen; we should not by any means become confused by fragmentary interpretations. It is essential to seek personal experience of realization; only then do you know the ultimate. If we were to take this one story, which only points to a process of practice, and augment it so that it would be perfectly complete, we would have to cite the saying of T’ang dynasty Zen Master Nan-ch’uan, “When people today see this flower, it is like a dream,” to be able to approach the final Zen work of letting go. In sum, this story only refers to the mental work involved in Zen; it is not completely relevant to the insight of enlightenment.